QR barcodes can be added to product packaging to give potential customers access to a whole range of product information. QR (Quick Response) can also be called a second generation or 2D code. They were created in 1994 by Denso-wave in Japan and are revolutionising the barcode industry. 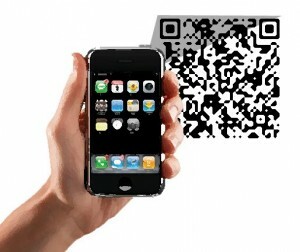 QR codes are linked to websites providing important information to consumers. In this information age consumers want to know more and more about the product they want to purchase & this is why their presence has kept growing. The black and white checkered squares can be scanned using a QR code reader application on smartphones. In an instant all the information stored on the barcode pops up on the users phone providing consumers with instant information about the product right in the consumers hand. This helps consumers make a better decision during their purchases. Customers install an application on their smartphone and use the camera to scan the barcode. QR codes are usually linked to websites, but they also can be used to add contacts to a phone’s address book, geo location, automatically dial a number, send an e-mail and gather product or service information on the spot. The picture to the left shows how a user would scan a QR code. It is very easy and straightforward, once the code is scanned the website with the information will pop up on the phone’s screen. QR barcode used to promote free gifts! On the picture on the left you can see the large QR barcode in front of the product being sold – prominently displayed on a Shelf Talker. 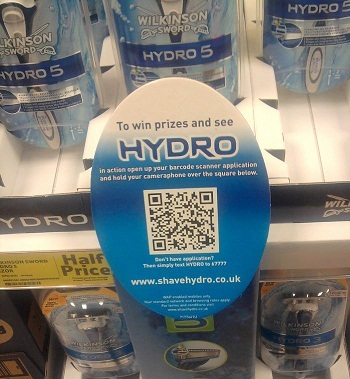 In this example consumers can scan the QR barcode and can have the opportunity to win/redeem a promotional prize! This is a great example of how effective QR barcodes can be used by companies to give more information to there consumers. These barcodes are found on all types of products and services. 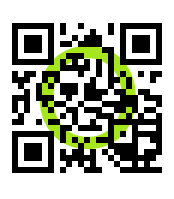 Create your own bar code on i-Nigma’s website! QR barcodes are great tools that should be added to all banners advertizing promotional products, giveaways, GWP campaigns. This will allow your clients to scan the QR code and have access to the website with all the information of the promotion on there phones. This is much more efficient then traditional banner advertising. It will allow your clients to come back to the information of the promotion when they have spare time in their day. Thus creating longer exposure to your promotional message! Check out our other blogs relating to smart phones and ways to display promotional campaigns! Barcodes & Labels – Great for Branding. Adding Value through Packaging – Champagne GWPs.